No waiting in lines for check-in either. At KEES, our goal is to provide the very best of Outer Banks vacation rentals; flexibility in your stay dates, amenity packages that make your stay more enjoyable, and service that will bring you back. We make check in a breeze. All KEES Outer Banks properties have digital door codes so no need to stop at a rental office before starting your vacation. We will email you a door code 24 hours before your 4pm check in. When you arrive, KEES provides a starter kit with K-cups, paper products, dishwashing detergent and more to make moving in easy. No need to carry linens and bath towels to your Outer Banks destination. KEES provides all bed linens and bath towels. Additionally, for all homes with five or more bedrooms we provide daily light housekeeping. Daily light housekeeping includes trash removal and towel exchange. 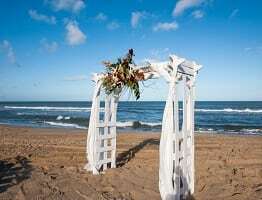 Renting an oceanfront home on the Outer Banks? 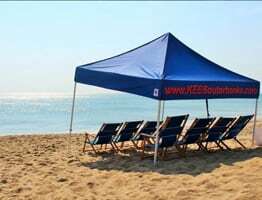 At KEES, we provide complementary seasonal beach cabana services at select oceanfront homes. You are just one click away to making your Outer Banks vacation your way. Our concierge services offer you an easy way to rent everything you need for fun in the sun. Need some shade on those Outer Banks beaches? Rent a cabana or umbrella with chairs all in the same spot you book your vacation rental home. Don’t worry about grocery shopping before arriving, we’ll set that up for you with our grocery delivery service. Capture family memories and schedule a beach photo shoot to capture the beauty of the Outer Banks. All our concierge services come at an extra cost, but gives you to ability to do everything in one place. At KEES, we are happy to help make planning your vacation easy and carefree.